Why build yet another computer wargame? With Rich Internet Application (RIA) technology, it's possible to substantively influence the next wave of wargaming. Many computerized games today have become increasingly complex and extremely difficult to learn - reducing the popularity of the overall hobby. My objective is to return to the basics: simplicity, ease of learning, straightforward rulesets and a meaningful historical context -- easily available on the internet! I have selected Silverlight for this project - a cross platform, cross-browser plug-in which facilitates the design, development and delivery of graphic intensive applications over the web. Leveraging Microsoft's .NET technologies, this approach was chosen to build the Rich Internet Application (RIA) required to deliver Napoleon at Waterloo to both enthusiasts and folks who want to learn more about wargaming in general. "Napoleon at Waterloo" is an exceptional introductory game from the heyday of wargaming in the 1970's. Developed by Simulation Publications Inc. (SPI), it's a simple, but elegant game, illustrating both the historical realism attainable in this type conflict simulation as well as providing an easy means for introducing players to basic game mechanics, to include, movement, terrain effects, combat, zones of control, etc. This is the current build of the Napoleon at Waterloo wargame as of June 2013. Click the “Play NAW Now” button to start the game. My blog provides additional details on the current status of this project. Please note – the following application is a testbed for my ongoing development, it is not the final product. Importantly, before you play Napoleon at Waterloo, you’ll need to install a Microsoft plugin called Silverlight. 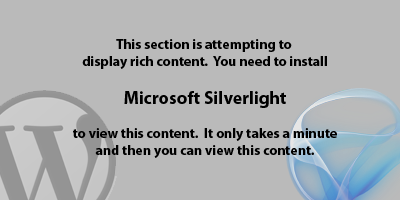 You can easily install Silverlight by going to the Microsoft Get Silverlight page. I have built this site to highlight the plans, techniques and interim products I’m developing in the building of a web based wargame — using the classic “Napoleon at Waterloo” wargame as the basis for this project. Description of Napoleon at Waterloo (NAW). The game “Napoleon at Waterloo” is an exceptionally good introductory game from the heyday of wargaming in the 1970’s. It was developed by Simulation Publications Inc. (SPI) and was provided to subscribers of the magazine “Strategy and Tactics”. It’s a simple game, but it is also elegant — illustrating both the historical realism attainable in this type conflict simulation as well as providing an easy means for introducing players to basic game mechanics associated with game-turns, unit placement and movement, zones of control, terrain effects, and randomized combat results. With the greatly appreciated permission of Decision Games, I’ve selected NAW as the basic ‘manual’ framework for the PC wargame development techniques being described on this website. Although I’m still developing the NAW Wargame, the following video highlights several of the key features, to include the User Interface, Command Panel and turn-based movement and combat actions. Victory Points as a basis for ‘winning’ the game. Design Objectives. In developing an overall General Design Specification, I identified the following set of key characteristics which I felt should be included within the game’s development. I had originally (over two years ago) started to develop NAW as a desktop application, initially using a Microsoft tool called DirectX, and then re-engineered it to XNA (another game development tool from Microsoft). I never really liked the result – it quickly became apparent that it would be very difficult to deploy the game across a large, diverse set of players. Therefore, I decided to do something slightly different — taking a Rich Internet Application (RIA) based approach. Specifically, I want the game to be able to be played by users on multiple different types of computers, under various operating systems, and be able to be played on each of the leading Internet Browsers. In other words, I think it’s important to make NAW much more portable…and accessable to a larger base of potential players. I have outlined my Technical Specifications here. Phase VI – Add a networking capability, so that two players can play against each other over the net, to include a ‘chat’ feature. My sincere thanks to Dr Christopher Cummins, publisher of Decision Games for his kind permission to use both Napoleon at Waterloo and Across Suez as the kickoff games for this site. My introduction to wargaming back in the 1970’s started with a friend providing me a copy of Napoleon at Waterloo — and I’ve been an avid hobbyist ever since. Doc Cummins and his staff at Decision Games continues to set the standard for historical accuracy, playability and active support of wargaming in general. My goal in publishing this NAWDevelopment.com website is to both (1) chronicle my design and development actions in transitioning these classic hexagonal board games to the web, and (2) provide a portal which enables new wargamers and veterans alike to enjoy playing their favorite gaming classics using what is called a “Rich Internet Application” – that is, web applications that have most of the characteristics of desktop applications, but are built to allow you to play them within a standards-based web browser. On this site, I will be providing updates on the programming of NAW and Suez. Using upgraded graphics provided by Decision Games, I am developing the web applications with the intent to retain the gameplay, rulesets and all the characteristics of more traditional board wargames — but with the ease of setup and interactive play inherent in PC-based games. I hope you enjoy playing them as much as I have enjoyed developing them. Decision Games, in business since 1988, is the publisher of Strategy & Tactics and World at War magazines, the military history magazine with a game in every issue. I was really excited to hear of Decision Games’ recent announcement regarding a new product line, the DG Folio series. The folio game series takes only minutes to learn and once one game is played, players can immediately play many more scenarios with the same standard rules. Most of these new folio games have a 17″ x 22″ map and 80-100 counters so set-up takes only a few minutes and most games take 60-90 minutes to play. The folio games are presented in a folio rather than a box for easy storage. Best of all is their low cost, less than half the cost of many boxed games! Many gamers will remember the classic SPI folio and quad games. Decision Games has taken those classic games and updated the maps and counters to the latest full color artwork; then updated the rules systems to make for all new series, to include several new games. In addition, Decision Games publishes a line of board games, books, and computer games on military history.